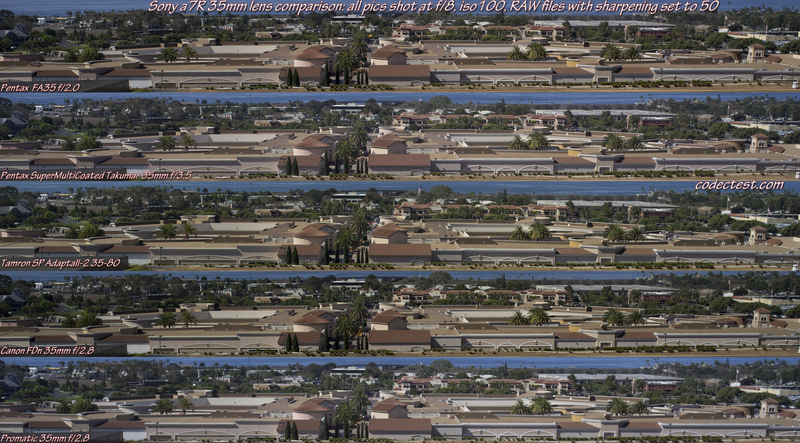 This is the first round of 35mm lens comparison testing, shot on the Sony a7R mirrorless camera. 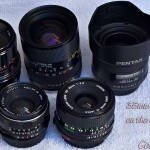 There are four 35mm SLR prime lenses here, and one 35-80mm zoom, tested at 35mm. Testing at the usual landscape distances was done at f/2.8-3.5, and at f/8. This is the longest focal length tested so far, and it comes with high hopes that the field curvature issues seen in previous rounds would be a thing of the past. It seemed like the FA35 corners should have been brighter than -2.71, but the test results were consistent even after re-testing. 35mm lens testing, CanonFDn, Promatic, Pentax FA35, Pentax S-M-C Takumar, and the 35-80 Tamron SP zoom lenses. 35mm lens vignetting test, on the CanonFDn, Promatic, Pentax FA35, Pentax S-M-C Takumar, and the 35-80 Tamron SP zoom lenses. 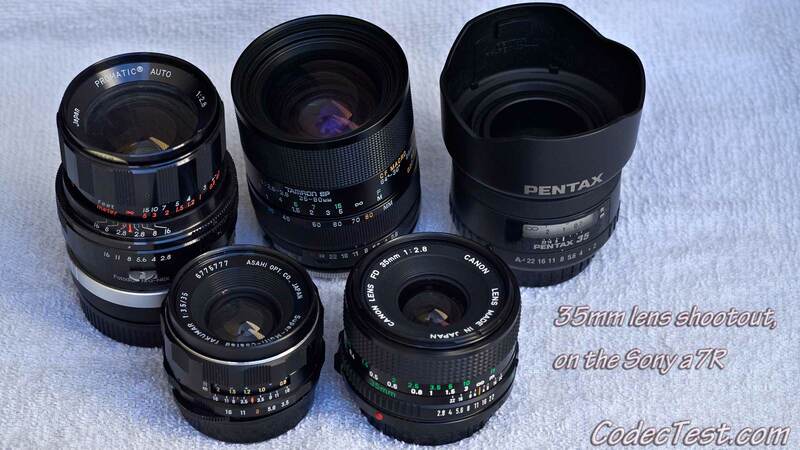 Ease of focus at long distances: Pentax FA35/2.0 all the way, for 2 points. It’s hard to imagine that an autofocus lens used in manual mode could top all of the competition, but it did. At the first stage of a7R magnification, the area of focus peaking was narrow and specific, and the focus ring was adequate. The Canon FDn just didn’t cut it here; the focus peaking area was too wide. The Tamron SP zoom felt like it was nearly a stop darker. Both it and the classic Pentax SMC Takumar 35/3.5 were tough to use wide open. Unfortunately the standard “5610” street number on the back of the building was in shadow during the test period, so it wasn’t clearly visible at full magnification, on any lens. Hence the need for focus peaking and partial magnification. The old Promatic 35/2.8 lens had radically different focus points at f/2.8 and f/8; wide open it was barely in focus, at it’s focus stop on the ring, but at f/8, it had plenty of room. Lens contrast: The Pentax FA35/2.0 and the Canon FDn 35/2.8 both look good, 1 point each, but the superiority of the FA35 with focus peaking could work in its favor. The diminutive Pentax Super-Multi-Coated Takumar 35/3.5 looked flat, but it appeared to be shot at a slightly higher exposure, which could have been a factor. 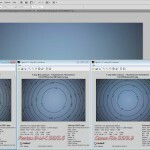 Sides of the images: *Wide open*: The Promatic 35/2.8 failed miserably, it’s gone. The Takumar 35/3.5 was weak on the outer extremes, so it barely failed as well. 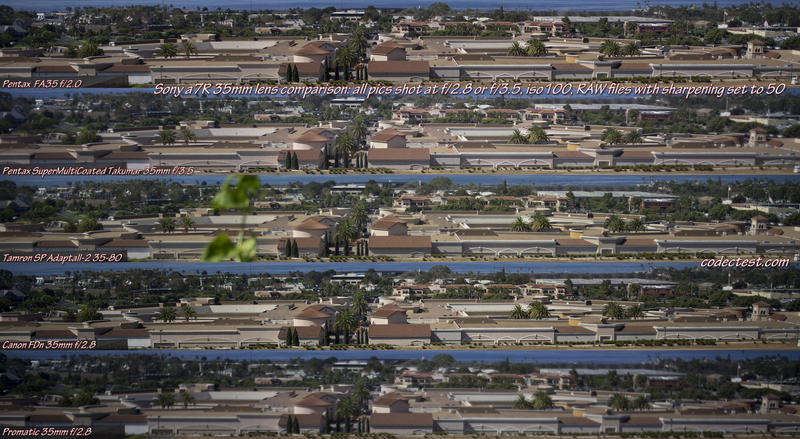 The Tamron SP 35-80mm lens had out of focus areas on the far left, and in a wide vertical swath on the right side as well, so it’s out due to defects. That left the Pentax FA35/2.0, which was outstanding on the right side at f/2.8, but weak on the left side, and the Canon FDn 35/2.8; you judge. *f/8*: Everything recovered to some extent, with the exception of the left side on the Canon Fdn 35/2.8, which doesn’t look much better than it did at f/2.8. The Super-Multi-Coated Takumar 35/3.5 is usable, but generally softer on the sides than it’s FA35/2.0 brethren. 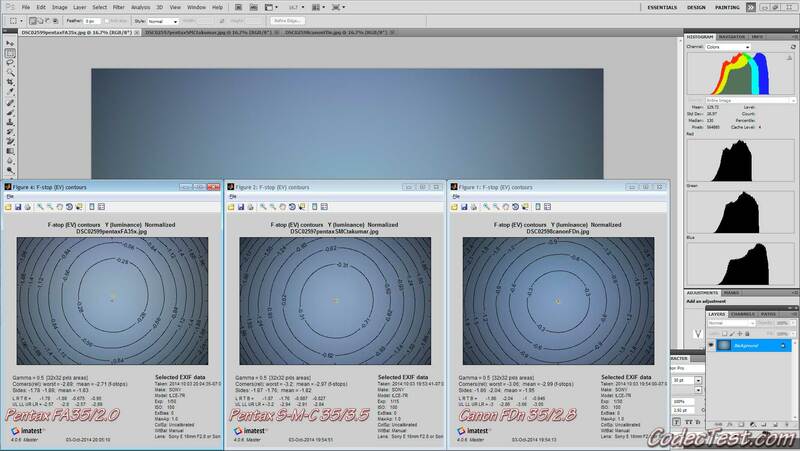 Center of the images: Pentax FA35/2.0 squeaks by the best of the competition, the Canon FDn 35/2.8; 1 point. Summary: If one of these lenses wasn’t weak on the side(s), it either couldn’t be focused well, or it had field curvature issues. Overall, it’s a weak field. However, since previous tests were judged only at F/8, that’s what will be used here; the Pentax FA35/2.0 moves forward into the next round. This entry was posted on Saturday, October 4th, 2014 at 10:52 PM	and is filed under Camera Lenses. You can follow any responses to this entry through the RSS 2.0 feed. You can skip to the end and leave a response. Pinging is currently not allowed.